It was less than a year ago that a lifetime of music collection went up in smoke. Actually, eyewitness reports suggest that the vinyl did not really go up in smoke so much as it dissolved into a molten bubbly mass for about twenty-four hours, eventually hardening into a shiny black orb. Long-time readers of this blog know I had made being a “vinyl lover” something of a fetish, part of my identity. Having that stripped away was a little disorienting, though it’s hard to untangle my feelings about music from everything else that was lost in the fire. I haven’t even begun to build a new record collection. Part of that is practical — right now I live in a furnished place, and I relish the idea of my next move being something I can do in a single carload (including the drumkit), so I have been re-acquiring possessions sparingly. But more than that, starting a new record collection from zero just feels too overwhelming to even contemplate. All this a roundabout way of saying that my music consumption is now almost exclusively streaming digital. WFMU remains my cultural touchstone, of course. I listen to it more than ever. What’s changed is my “on demand” listening. I am a Spotify Premium subscriber, which offers decent 320kbs sound quality (I’ve also been dabbling with higher quality Roon/Tidal options), offline access to favourite songs, and playlists. It’s not ideal, and I’m not thrilled with how streaming services treat artists, but right now it’s an affordable option that works conveniently for me. Spotify has also been fairly aggressive in trying to exploit the data of its users for myriad effects and studies. Some of the implications are fascinating, some creepy. I usually tend to live on the info-paranoiac end of the spectrum, but in this instance I have made a conscious decision to let those concerns slide. Mostly, I don’t want to live without music. Also, music seems like an interesting place to observe how the algorithm-driven life might play out in reality. A few weeks ago I read about Spotify’s new Discover Weekly Playlist, which is billed as “a completely personalized playlist”, constructed out of the data it has gleaned from your listening patterns, yet oriented to artists you aren’t actively listening to. What’s interesting is how the algorithms are constructed, and how much of what can only be described as editorial work goes into the playlists. Doug Ford, Spotify’s director of music programming, walked us through how a Spotify playlist comes together. That’s only a sampling, but it’s fairly representative. Post-punk. Indie. Slightly off-mainstream classic rock. In short, dad rock. 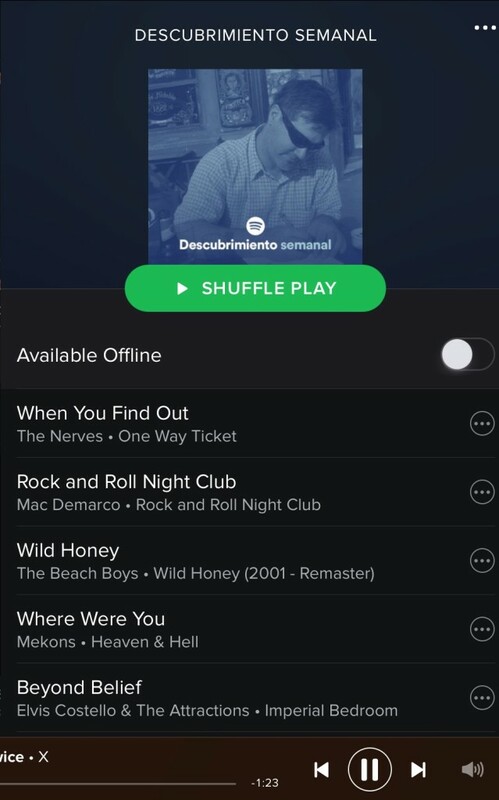 In some senses, I am impressed by the playlists. I rarely hate a song they recommend. I even realized I liked Paul McCartney’s “Monkberry Moon Delight”, so in some ways Spotify knows me better than I know myself. And I suppose I am impressed that Spotify knows that if I am playing hip-hop, it’s probably because I am listening with my son. But that also points to a defect in this thinking. Just because I mostly listen to hip-hop with my son, that doesn’t mean I don’t want to listen to it any other time. In fact, I would love to get turned on to some fresh and inventive artists so I am not always at my son’s mercy when we listen. But worse than that, I feel like Spotify is really not playing close attention to me. When I look at my tagged favourite songs, and my play histories, I really don’t listen to all that much dad rock these days. (Honest!) Lately, it’s been a lot of 1970’s funk, freaker country (natch), old time country and folk (lots of Jimmie Rodgers), Latino music (traditional, electronic, and some prog that Pedro turned me onto). And the raw power of really smooth music, of course. None of this is reflected in any of the playlists so far. The closest its come is one track by Os Mutantes (which may have been the first Latin psychedelic group that I listened to, more than twenty years ago), and one track by Gram Parsons and the Flying Burrito Brothers (which again, was music that changed how I thought about country music, but that was long, long ago). More than turning me onto music that I didn’t know existed, the Discover Playlists seems very good at reminding me of the music I listened to when I was a student. Which makes me wonder if they are trying to shoehorn me into their finding of how our musical tastes “flatten” at a certain age. It feels like a glimpse of how more experiences will be in the near future. It’s easy to make parallels with the current trajectory of ed tech. Let’s just hope the human sensemakers manage to keep on keeping on. Loved the post and agreed 99.99%. In case you didn’t know about it, http://scrobblealong.herokuapp.com/ tells last.fm what you’re listening to on WFMU (and a few other radios), which can be useful. Old article of the day that you might like: http://www.nytimes.com/2009/10/18/magazine/18Pandora-t.html (2009!!). Love the Céline Dion story :-P.
César, what an amazing comment, thank you! One thing I have not done enough is take advantage of the social part of Spotify. I have had some friends share playlists with me and I absolutely love that. Not sure if you can find me, but my username is “abjecter”. Would be great to share music with you again. Thanks for the bonus links — I had no idea “scrobbing” could work with WFMU. I wish I had known that possibility years ago. I never really scrobbed, but I know friends that have tended that carefully for years and they tend to love that data-set. Are you one of those people? Finally, thinking of you and my Catalan friends on election day. I hope you are happy with the results. I just followed you :-). I “am” http://www.last.fm/user/chechar (and also https://open.spotify.com/user/chechar, but to a lesser degree). Marc, your criticism is valid. And if I understand it correctly, you may have articulated the real impulse behind this post. What interests me here about listening and following developments with Spotify is it’s a place where I can track my relationship with a personalized big data model within a domain I find endlessly fascinating. I agree that tension between music, identity, and those deeper impulses you describe is a big part of that. I suppose my stance here seems harsh, to an extent I was playing up a persona to make the writing more fun. I did the same thing in my previous post goofing on Monsanto. I suppose it muddies the waters for readers, but I just can’t help it sometimes. I also have tried really hard to curb my “music snob” tendencies, partly because I have plenty of unhip pleasures… I won’t say guilty pleasures because I truly love them. Also, if music feels good in people’s nervous systems, and provokes an emotional response, it is pointless for anyone to be judgmental. That said, I *love* talking about music, and there is a certain type of conversation where you are trashing music with friends that is about as much fun as anything I ever get to do. I can’t help myself sometimes. Anyhow, thanks for the fantastic comment. Maybe we’ll get to talk WFMU again sometime soon. Your point about the big data model that is Spotify are interesting. You get to see yourself as a set of data points, and then you can measure the real you (the one you think of as actually you) against the data set. Of course, for me this is always humbling–I try to see myself as really unique, but then it turns out that I’m not much more than my zip code according to political pollsters and market researchers. Sometimes I like to scoff at, say, Facebook’s misguided attempts to direct ads at me. But sometimes they’re right. Sometimes you are actually in the Matrix. But perhaps an existentialist living there. Of all the musical services I have tried over the years, none has a better algorithm tuned to me than my old East Van buddy Brad. Brad used to send me monthly mixed tapes to my cold Northern Alberta hovel. It was the best stuff I had never heard of, but absolutely needed to hear. Big data tries to predict the future by using the past. Yeah, it kinda works, but it often fails to take into account the current context. It also can’t account for the fact that we are humans and, by nature, are unpredictable and often act in ways that we might not even understand ourselves. Cesar makes a really important observation about networked social learning when he says that he wishes that he could see your weekly playlist. This is where the unexpected comes from. The jolt out of the comfort zone that big data tries to lull us into. The people who we follow for reasons we may not even be aware of, but that interest us for reasons that may not be clear. Mind you, those algorithms are getting better. It wouldn’t have been too long ago that people of our, ahem, prairie vintage would likely have been served up a steady supply of Harlequin, BTO, Toronto and Chilliwack . How is Brandy not on that list? A very brave and confessional post, Brian. My hat’s off to your naked assertion of dad-music-ness. I also appreciate learning from your musical voyage through these tune-sharers. Alas, none of them work for me. Most of my music comes from YouTube, where I either descend upon certain tracks with surgical precision, relish the playlists *I* have created with some degree of obsession, or gingerly follow playlists created by odd people and labels. Sometimes I revert to DVDs, especially when Fairpoint, our local “service” “provider”, fails. I also religiously relisten to WFMU’s My Castle of Quiet. Hm. This comment is getting long. Maybe I should fire back with my own confessional post. I’m surprised at the prominence of YouTube in your diet. It’s probably the most common choice with my son and his crowd as well, and that has always puzzled me for reasons of usability and audio quality. Then again, it almost always the place most likely to have some rarity available. There are a number of near-essential listens where that is my only option — unless I buy a new turntable and re-start my vinyl collection with some expensive mail-order purchases. I still open up my weekly Discover Playlist every Monday with a strange mix of anticipation and dread. It’s still much as it was was when I wrote this… I think I do get a few more novel listens in the batch more often. Or maybe I am just more comfortable with my banality. I have a friend who calls her weekly playlist “confrontation therapy”. I think I recommended Berger’s Castle of Quiet to you some years ago. I take an un seemingly amount of pride and pleasure that it connected with you so strongly. It’s an occasional listen for me… It sure does scratch a certain itch. I don’t pump iron like you, so let’s not compare dad-bods. Rarity is a large part of it. If I want to compare different recordings of Boris Godunov, no other service is going to cut it. Control also matters. Sometimes I want my particular assemblage of Scandinavian death metal , and don’t want to dither around while Spotify or whatever lurches from thought to suggestion. Thank you again for the Bergerismo. Very rich stuff. PS: it’s never too late to start grabbing kettlebells!